While I was gone, the Knitsmiths said good-bye to Ariel who moved back out west. 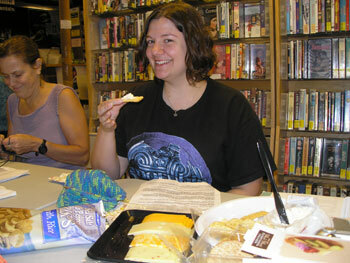 Since we were always making jokes with Ariel about how much we and she love cheese, we had a cheese party for her on her last day. Good luck, Ariel! We'll miss you! Ariel. Socks. Two at a time. Magic Loop. Seems like all my Ariel pictures look the same. Except she's got a new pair on the needle every week. This week, it was rpm socks. Sock on, Ariel! More blue socks for Ariel! 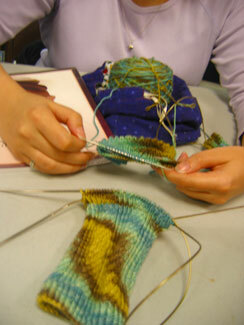 Ariel and Kris are both working on socks from the Socks that Rock sock club. Beautiful colors! 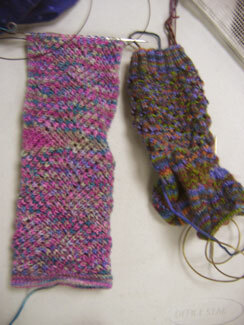 They've worked out corrections to the Hippy Crunchy sock pattern (on the left). Check out their suggestions here. 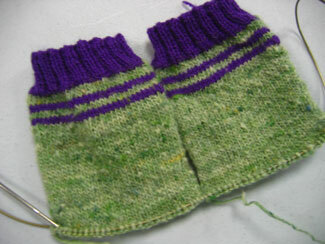 Aren't Ariel and her latest socks-in-progress looking great?! Ariel's constant obsession is socks, of course. These are some she was working on for a few minutes in August. Ariel's latest socks. They're XXL she says, and she don't just mean the yarn (the feet are 10 1/2" long!). Ariel's latest socks are for her! 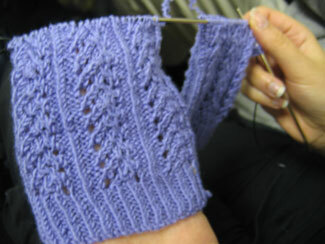 She's got some mystery yarn and is doing a lovely lace pattern. 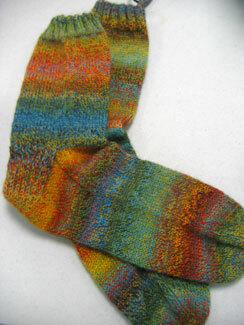 Ariel's socks of the week are her sockapaloooza sock savior socks. This is like her 14th pair so far this year! 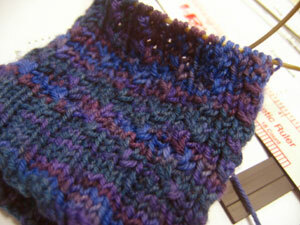 And again Ariel shows up a week later with another almost-finished pair of socks! How does she do it? 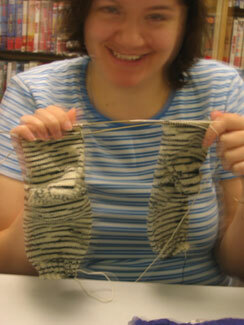 I managed to hold still long enough to get a close up of the little design feature she's added to the Opal Zebra socks. She's purling all the stitches where the black meets up with black - isn't that cool?! 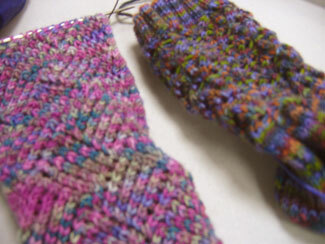 Somehow she manages to show up every week with a new almost finished pair. 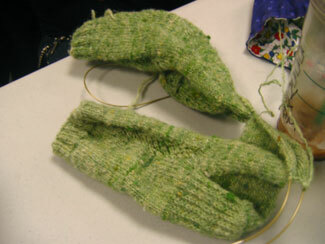 This week's pair are fuzzy green socks in some mystery handspun yarn. And she's already done with them! 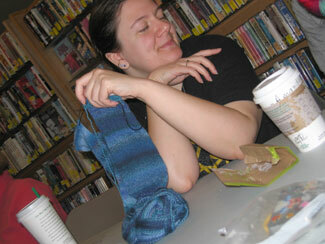 A double-pic: of Ariel's latest socks in progress and her new haircut! She donated a foot of hair to Locks of Love. 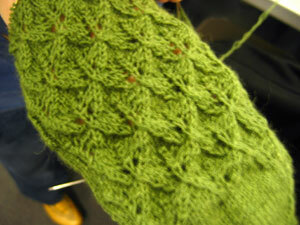 And the lovely socks are a lacy pattern in green Knitpicks Essential sock yarn. Very nice, Ariel! 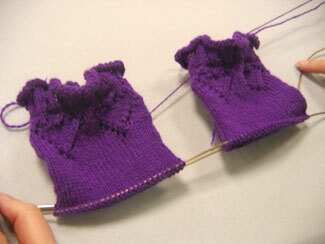 Ariel's started her sockapaloooza socks! She loves knitting socks two at a time. This week, Ariel took a break from her sock savior Whitby socks to start Conwy socks (also from Knitting on the Road) for herself in some lovely Lorna's Laces. 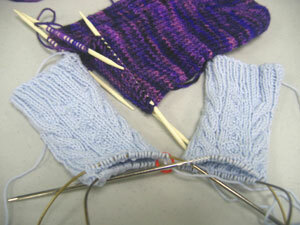 Ariel and I were both working on our sock savior socks this week. 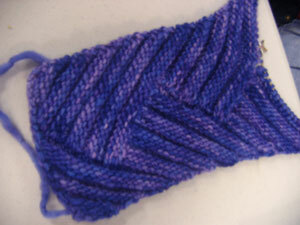 My second purple Koigu sock is almost done and Ariel's knitting her blue cotton Whitby's at the same time! 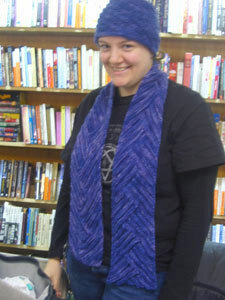 Ariel finished up her Multidirectional Rib scarf this week. And she made a matching hat to complete the set. 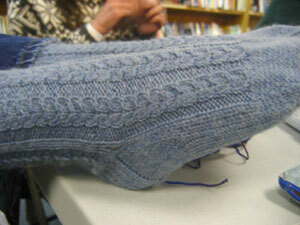 Ooh, lookie, she's also wearing handknit socks! 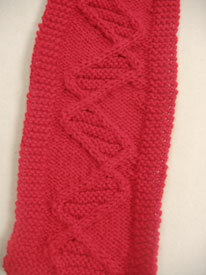 Ariel's amazing multidirectional ribbed scarf. 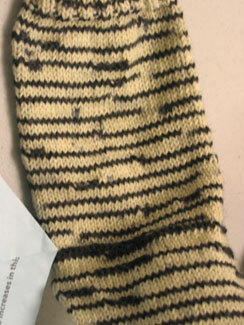 The pattern is from MagKnits. 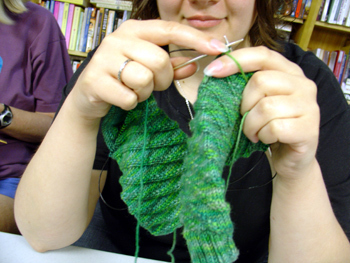 Ariel is making the DNA scarf. What a great design. 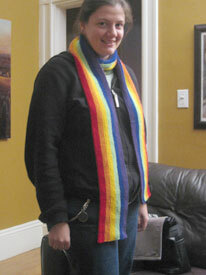 New Knitsmith, Ariel, joined us this week and managed to bind off her long side-to-side rainbow scarf. Isn't it cool?! She found the perfect colors in Lion Brand Microspun.